Lake Garda - like virtually anywhere in Italy - has its own treasure trove of tastes and dishes made from local produce. As Italy is the largest wine-producing country in the world, it's not surprising that both the red, white and rosé varieties feature on the list of regional specialities, while even close to the southern foothills of the Alps the fruit of the area also has a special place in the culinary history and culture. The north of Lake Garda is part of the Trento-Alto Adige region and offers the distinctive Trentino dry white wines, as well as some sparkling and dessert wines as specialities. 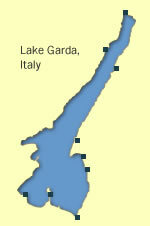 On the eastern shore in the south is the major wine-producing area behind Garda and Bardolino. Bardolino wine is a light red (it also offers a "chiaretto") and the town has a popular wine festival at the end of the summer. 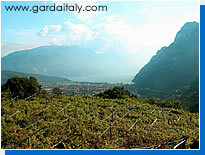 To the south and west is the region of Lombardy, with the Garda and Garda Classico DOCs in the area around the lake and between it and Brescia offering both red and white wines. Looking for some of the best-rated hotels on Lake Garda? 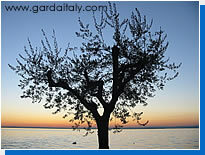 Although olives are grown all around Lake Garda the main concentration of olive groves is in the flatter southern areas. Like wine, olives have their own specific classification system and the Extra Virgin Olive Oil from the Garda DOP is controlled by inspectors and certified by the Ministry of Agriculture. The olive oil from the lake is considered to be the furthest north of all areas of production and the olive oil produced has a light, fruity and non-acidic taste. There is an olive oil museum on the road between Bardolino and Lazise. Lemons have been grown all down the east coast of Lake Garda and the farming dates back to the 15th century. But it is probably Limone, with its lemon houses or "sardì" still visible from the ferry, which has the closest association with the fruit. 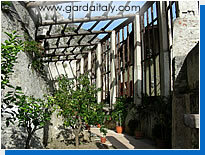 The Limone industry was fatally affected by a drop in price and competition from other areas, but the traditional structures and ways of growing the plants have been preserved in a number of areas and there is an interesting lemon house museum which it is possible to visit.